Tuition: Seminar: $265.00 Model Fees: $75.00 Total: $340.00 plus 4.712% GET (12% Kama’aina/Military and 17% Alumni discounts of the tuition portion are available for this class). Tuition includes our Essential Guide to Using Flash e-Book. Participants are responsible for their own film and processing and/or digital processing. Course Notes: This is an advanced level class. Participants are expected to possess a working knowledge of the basics of photography. Participants must be 18 years of age or older. 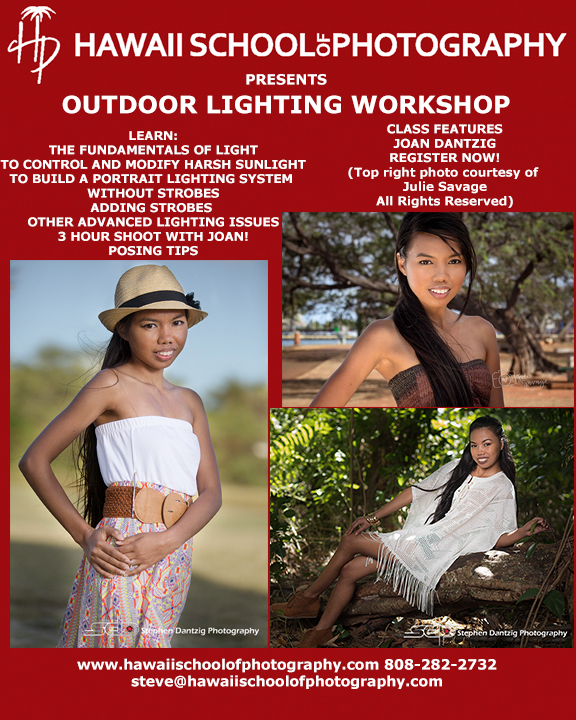 Classes are limited to 10 students and will be held from 9:00 AM to 5:00 PM (The live shoot will begin at 1:00 PM). Bring a lunch and plan to work while eating! Models subject to change based on availability. ALL IMAGES PRODUCED UNDER THE DIRECT SUPERVISION OF STEPHEN DANTZIG OR OTHER HSP INSTRUCTORS ARE FOR PERSONAL USE ONLY AND MAY NOT BE USED FOR COMMERCIAL PURPOSES OR SOLD IN ANY MANNER. PHOTOS MAY BE POSTED ON FACEBOOK AND/OR YOUR WEBSITE WITH NOTIFICATION THAT THEY WERE CREATED AT A HSP SEMINAR.